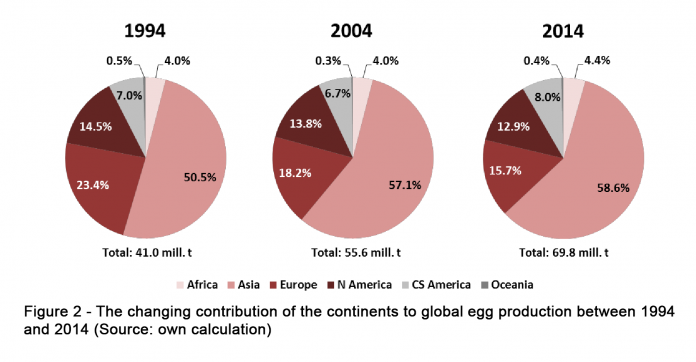 In the past two decades, global egg and poultry meat production showed remarkable dynamics. The increase was not homogeneous, however, but led to considerable spatial shifts. This will be documented in the first part of a series of two papers. The second paper will then present a projection of the expected future dynamics. 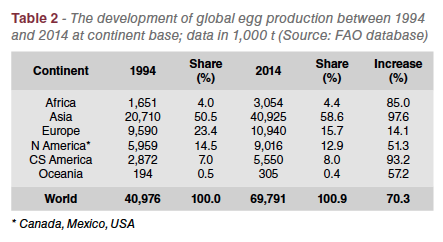 Table 1 and Figure 1 show that global egg production grew by 28.8 mill. t or 70.3 % between 1994 and 2014. In the same time period, poultry meat production increased by 62.0 mill. t or 121.8 %. To this increase, chicken meat contributed 56.7 mill. t or 91.5 %. While the gap between egg and poultry meat production was only 10 mill. t in 1994, it was already as wide as 43.1 mill. t in 2014. When focusing on chicken meat only, the difference in the production volumes increased from 2.7 mill. t to 30.6 mill. t. Only these few data documents the remarkable success of chicken meat production, of which 90 % is broiler meat. It will have to be explained which factors caused the remarkably high growth rates. Compared to chicken meat, the other poultry meat types are less important. Turkey meat showed the lowest absolute and relative growth rates between 1994 and 2014 with 1.4 mill. t respectively 32.0 %. Without going into detail one can conclude that this is the result of the concentration of turkey meat production in the USA and some EU member countries with a comparatively high per capita consumption. Turkey meat is of only minor importance in Africa, Asia and Oceania. Because of the dominance of chicken meat, the analysis of the dynamics in poultry meat production in this report will concentrate on chicken meat. 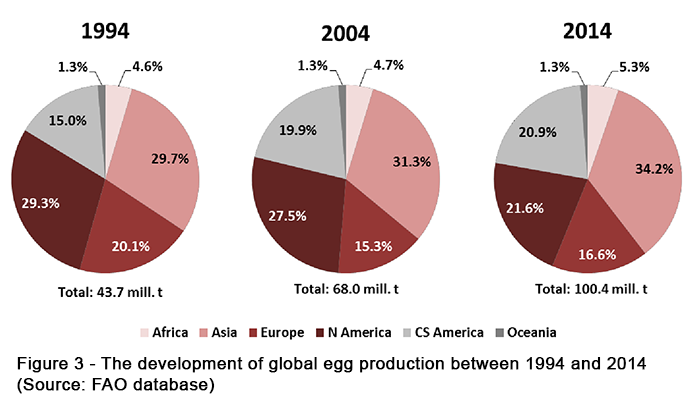 In Table 2, the development of global egg production at continent level is documented. The highest absolute and relative growth rates showed Asia. This continent alone contributed 70.2 % to the global increase. In North America, the production volume grew by 3.1 mill. t or 51.3 %; in Central and South America by 2.7 mill. t or 93.2 %. The lowest relative growth rate was to be found in Europe with only 14.1 %. Despite a remarkable relative increase, Africa only shared 4.4 % of the global production volume in 2014. In contrast to Asia and Central and South America, Europa and North America were not able to maintain their share in global egg production. 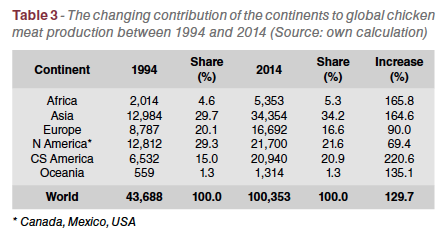 Europa lost 7.7 % of its share in 1994, North America 1.6 %; on the other hand, Asia gained 8.1 % and Central and South America 1.0 %. The spatial shift from Europe and North America to Asia and South America is obvious (Figure 2). The dynamics in global chicken meat production differed considerably from that in egg production as can be seen from the data in Table 3. Asia showed the highest absolute increase with 21.4 mill. t, but the contribution to the growth of the global production volume was much lower with 37.7 % compared to 70.2 % in egg production. 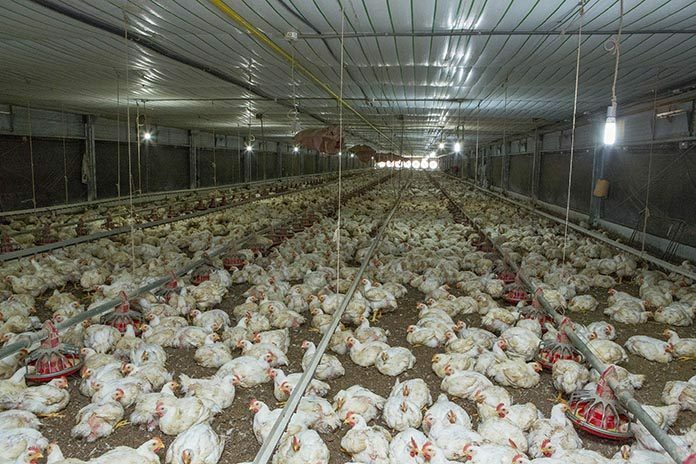 This is due to the remarkable growth of chicken meat production in Central and South America with 14.4 mill. t and the also considerable absolute growth in North America (+ 8.9 mill. t) and Europe (+ 7.9 mill. t). Despite the high absolute increase in their production volumes, North America lost 7.7 % of its share in 1994 and Europe 3.5 %; in contrast, Central and South America gained 5.9 % and Asia 4.5 %. While the contribution of Asia and North America to the global production volume was almost identical in 1994, chicken meat production in Asia and Central and South America grew much faster in the following two decades as can be seen from the relative growth rates of these two continents. With a relative increase of 220.6 %, Central and South America showed an extraordinary dynamic. Despite the high relative growth, Africa´s share in global chicken meat production increased by only 0.7 % (Figure 3). 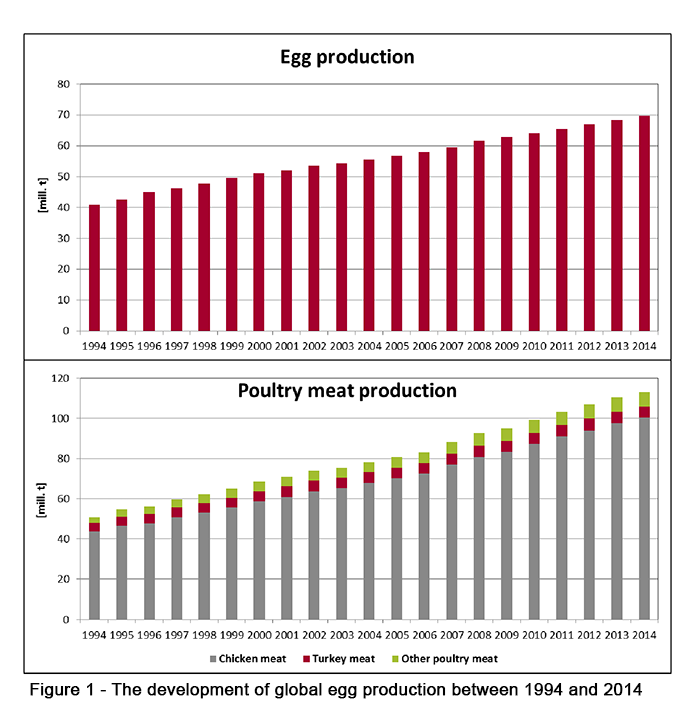 Global egg and poultry meat production showed a remarkable dynamic between 1994 and 2014. Poultry meat production grew even much faster than that of eggs. The high absolute and relative increase of poultry meat production is mainly a result of the extraordinary dynamics in chicken meat production. With a production volume of more than 100 mill. t, chicken meat surpassed egg production by over 30 mill. t.
The success stories of these two commodities are a result of progress in breeding, feeding and housing systems. In addition, the fact that no religious taboos speak against the consumption of eggs and poultry meat explains the fast globalisation of these commodities. In egg as well as in chicken meat production, a considerable shift from Europe and North America to Asia and Central and South America occurred in the analysed time period. 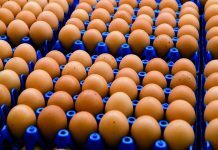 In egg production, Asia reached a dominating position with a share of 58.6 % in the global production volume. In chicken meat production Asia also showed the highest absolute growth, but the relative increase was highest in Central and South America. 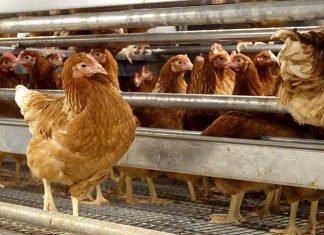 Despite a considerable increase in their production volumes Europa and North America lost shares in global egg as well as in chicken meat production. 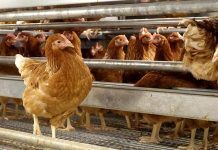 It can be expected that because of the favourable feed conversion of laying hens and broilers, egg and chicken meat will gain in importance as protein sources for the alimentation of a growing global population.